From Bergamo it is an easy journey to the resorts on the western side of Lago d’Iseo. 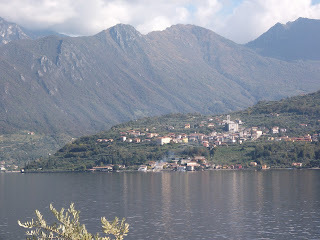 There are regular buses from the bus station in Via Bartolomeo Bono or you can drive to the lake in less than an hour. The Bergamo side of Lago d’Iseo is well worth visiting as it is quieter and scenically more dramatic than the eastern side, which falls within the province of Brescia. Furthest away at the top of the lake is Lovere, with its backdrop of mountains, which was selected for the 2009 edition of I Borghi piu belli d’Italia (the most beautiful small towns in Italy) guidebook. There are old churches, towers and a renowned art gallery, the Galleria dell’Accademia Tadini. From Lovere there are regular boats to Pisogne, Sarnico and Iseo. The rugged scenery between Lovere and Tavernola Bergamasca is claimed to have inspired Leonardo da Vinci to paint the mountains in the background of Mona Lisa. You can travel along the shore by either car or bus, but probably the best way to enjoy the views is from a boat out on the lake. From Tavernola Bergamasca you will have good views of Monte Isola, the large island in the middle of Lago d’Iseo, which is just a short crossing away. There are regular boats going back and forth, making it possible to visit the island just for a short time. Sarnico, at the foot of the western shore, is a charming medieval town with cobbled streets climbing away from the lake that are crammed with interesting things to see.